My current research focuses primarily on the philosophical, ethical, cultural and political dimensions of species extinctions, and is rooted in an approach that draws the humanities into conversation with ecology, biology, ethology and ethnographic work with communities whose lives are entangled with disappearing species in a range of different ways. Forthcoming papers, accepted for publication but not yet available, are listed here. Please get in touch if you’re unable to locate copies of any of the below publications. van Dooren, T. (2019) The Wake of Crows: Living and Dying in Shared Worlds, Columbia University Press: New York. 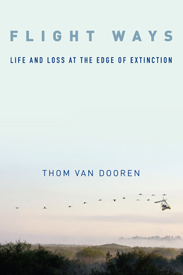 van Dooren, T. (2014), Flight Ways: Life and Loss at the Edge of Extinction, Columbia University Press: New York. van Dooren, T. (2011), Vulture, Reaktion Books: London. Rose, D.B., T. van Dooren and M. Chrulew (2017), Extinction Studies: Stories of Time, Death and Generations, Columbia University Press: New York. Lunney, D., M. Predavec and T. van Dooren (2017) “Zoology on the Table: The science, sustainability and politics of eating animals,” special issue of Australian Zoologist. van Dooren, T., U. Münster, E. Kirksey, D.B. Rose, M. Chrulew and A. Tsing (2016), “Multispecies Studies,” special issue of Environmental Humanities, vol. 8.1. Metcalf, J. & T. van Dooren (2012), “Temporal Environments: Rethinking Time and Ecology,” special issue of Environmental Philosophy, 9.1. More information on edited collections. Kirksey, Eben, Paul Munro, Thom van Dooren, Dan Emery, Anne Maree Kreller, Jeffrey Kwok, Ken Lau, Madeleine Miller, Kaleesha Morris, Stephanie Newson, Erin Olejniczak, Amy Ow, Kate Tuckson, Sarah Sannen, and John Martin (2018) “Feeding the flock: Wild cockatoos and their Facebook friends,” Environment and Planning E: Nature and Space. Kearnes, M. and T. van Dooren (2017) “Re-thinking the final frontier: Cosmo-logics and an ethic of interstellar flourishing” GeoHumanities. van Dooren, T. (2016) “The Unwelcome Crows: Hospitality in the Anthropocene,” Angelaki: Journal of the Theoretical Humanities, vol. 21.2, pp. 193-212.
van Dooren, T., E. Kirksey and U. Münster (2016) “Multispecies Studies: Cultivating Arts of Attentiveness,” Environmental Humanities, vol. 8.1, pp. 1-23. (Reprinted by invitation in Manoa: A Pacific Journal of International Writing, Winter 2010; and, Erica Fudge and Clare Palmer (eds.) Veterinary Science: Animals, Humans and Health, Open Humanities Press: Living Books about Life, www.livingbooksaboutlife.org). Rose, D., T. van Dooren and M. Chrulew (2017) “Telling Extinction Stories: An Introduction” in Deborah Rose, Thom van Dooren and Matthew Chrulew (eds.) Extinction Studies: Stories of Time, Death and Generations. Columbia University Press: New York. van Dooren, T. and D. Rose (2017) “Keeping Faith with the Dead: Mourning and De-extinction,” Australian Zoologist, 38.3, pp. 375-378.(PDF). van Dooren, T. (2015) “Vulture Stories: Narrative and Conservation,” in Katherine Gibson, Ruth Fincher and Deborah Bird Rose (eds.) A Manifesto for Living in the Anthropocene, Punctum Books: New York. van Dooren, T. (2014) “Care” in the Living Lexicon for the Environmental Humanities, Environmental Humanities, 5, pp. 291-294. Rose, D. & T. van Dooren (2010): ‘Extinctions’ entry in Encyclopedia of Geography, SAGE Reference (winner of an “Outstanding Reference Source” award at the American Library Association meeting, 2011). van Dooren, T. (2018)”Unraveling the worlds of snails” (in French translation), Billebaude, vol 11 (published by Musée de la Chasse et de la Nature in partnership with the IUCN). van Dooren, T. (2016) “Le blues des grues blanches: Violence du soin dans la préservation des espèces” Judith Chouraqui, Cyril Lecerf Maulpoix, Romain André and Grégoire Chamayou (trans. ), Jef Klak, 30.
van Dooren, T. (2016) “La partie des manchots” in Revolutions Animales, Karine Lou Matignon (ed. ), Coédition ARTE éditions / Les Liens qui Libérent. van Dooren, T. (2016) “L’arche des morts-vivants, un espoir ?” in Revolutions Animales, Karine Lou Matignon (ed. ), Coédition ARTE éditions / Les Liens qui Libérent. van Dooren, T., E. Kirksey and U. Münster (2016) “Estudos multiespécies: cultivando artes de atentividade” Susana Dias (trans. ), ClimaCom, 3.7.